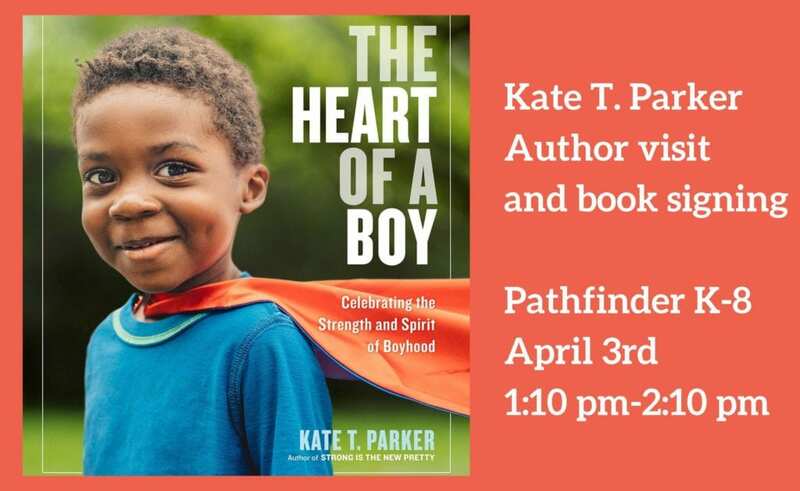 Our Pathfinder K-8 library is hosting an author visit with Kate T. Parker on Wednesday, April 3rd from 1:10-2:10 pm. Strong is the New Pretty was phenomenal and her new book, Heart of a Boy is just as powerful. Parents and community members are welcome! Look for a book pre-order form from your child’s teacher. The Heart of a Boy is a deeply felt celebration of boyhood as it’s etched in the faces and bodies of dozens of boys, ages 5 to 18. There’s the pensive look of a skateboarder caught in a moment between rides. The years of dedication in a ballet dancer’s poise. The love of a younger brother hugging his older brother. The unself-conscious joy of a goofy grin with a missing tooth. The casual intimacy of two friends at a lemonade stand. The shyness of a lone boy and his model boat. The intensity in a football huddle. There are guitarists, fencers, wrestlers, star-gazers, a pilot—it’s the world of our sons, in all their amazing variety and difference.